The Adoration of the Magi is an early painting by Leonardo da Vinci. The ruins are a possible reference to the Basilica of Maxentius, which, according to Medieval legend, the Romans claimed would stand until a virgin gave birth. It is supposed to have collapsed on the night of Christ's birth (in fact it was not even built until a later date). The ruins dominate a preparatory perspective drawing by Leonardo, which also includes the fighting horsemen. The palm tree in the centre has associations with the Virgin Mary, partly due to the phrase 'You are stately as a palm tree' from the Song of Solomon, which is believed to prefigure her. Another aspect of the palm tree can be the usage of the palm tree as a symbol of victory for ancient Rome, whereas in Christianity it is a representation of martyrdom--triumph over death-- so in conclusion we can say that the palm in general represents triumph. The other tree in the painting is from the carob family, the seeds from the tree are used as a unit of measurement. They measure valuable stones and jewels. This tree and its seeds are associated with crowns suggesting Christ as the king of kings or the Virgin as the future Queen of heaven, also that this is nature's gift to the new born Christ. As with Michelangelo's Doni Tondo the background is probably supposed to represent the Pagan world supplanted by the Christian world, as inaugurated by the events in the foreground. 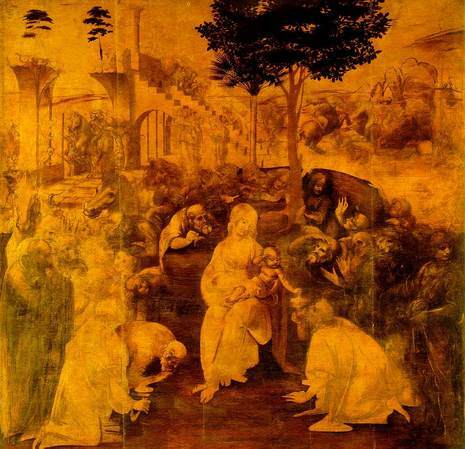 Leonardo develops his pioneering use of chiaroscuro in the image, creating a seemingly chaotic mass of people plunged into darkness and confusion from which the Magi peer towards the brightly lit figures of Mary and Jesus, while the pagan world in the background carries on building and warring unaware of the new revelation.